When I chose The Way We Eat: Why Our Food Choices Matter, I had no idea who the authors were, but thought it would be an interesting book to add to my library of food journalism. I didn't realize that Peter Singer was a world-renowned moral philosopher and the author of one of the first books that brought to light abuses in the factory farm model: Animal Liberation. Jim Mason is also a well known author in this field and is an attorney as well. Together, Singer and Mason seek to address the realities of what we eat and make readers question the ethics of these choices. I will say I did not expect to be so challenged by this book - not in the sense that it was difficult to understand - in fact, the text was incredibly accessible. I was morally challenged by this book and forced to examine my food choices in ways I never have before, even though I consider myself to be a very ethical eater and consumer. It reminded me of my college philosophy and literature classes, but in a good way. Throughout the book, Singer and Mason discuss the grim realities of factory farming, including meat, dairy and egg production, with some details that are actually difficult to listen to (and some sections even contain warnings for readers about graphic content). They also discuss labeling and issues of fair/whole trade, workers' rights and environmental issues. The book is too full of substantial content for me to even attempt to distill it here. 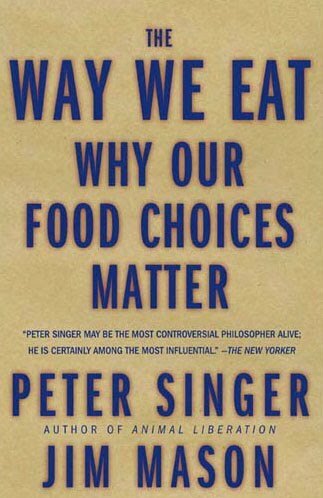 However, I think it's worth noting the initial question that Singer poses in the beginning of the book: can the choices we make about food consumption have ethical implications? If you believe that the choices you make about food can have moral or ethical implications, what are they? How do you determine what is an ethical or moral choice? I personally believe food consumption does have ethical implications; part of this stems from my own faith and belief that I am called to be a good steward. But even without a religious imperative, we do not live in a vacuum. Unless you hunt and gather and produce all of your food with no assistance from anyone or anything, your food choices affect others. This book asks you to consider how what you purchase and consume affects animals, the environment, the welfare of communities located in proximity to these factories, and the other people who work there. The authors acknowledge the weight of these ethical implications and how our food choices are part of a complex web. To make one ethical choice, for instance, buying local produce to support farmers in your community, means that you are not purchasing food from developing nations, where the farmers arguably need the money even more. No one person can make decisions that can satisfy all potential ethical obligations, and ultimately we simply have to do the best that we can. I can't recommend this book highly enough. For anyone that is questioning how he/she can make better choices or why we should make different choices in the first place, I encourage you to read this book. Let it stretch your brain and your ideas like it did mine.